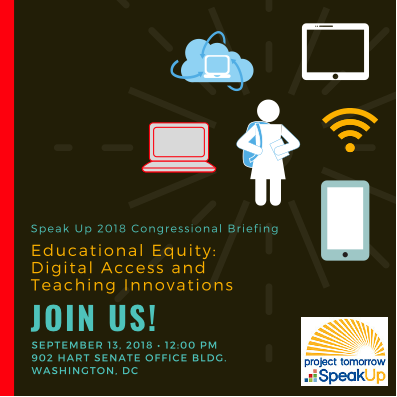 Each year, Speak Up hosts at least one Congressional Briefing in Washington, D.C. to share the national findings from our research. We bring the voices of all the students, parents, educators and community members to the Hill to be sure our policymakers are hearing directly from those most impacted by national education policy. In addition to sharing the research findings, each briefing includes a panel of students and/or educators who can tell their own stories about how they are (and are not) using technology for learning. We include everyone from third graders to superintendents on our panels because we think all of their views and experiences on learning - in and out of school - are important. In the last few years, we have also streamed the briefings live online to expand the audiences for these informative sessions. You can find information about upcoming briefings and archives of our past briefings (including links to reports, presentations and video recordings) on this section of our website. Learn more about the September 13th briefing.